What are the most common foot ailments Americans have? How important is foot care to Americans? Fifty-one percent of those surveyed said these foot issues affect their ability to walk, stand, exercise, sleep, work, play with their children or grandchildren, and travel. While almost everyone could agree that it was important to pay attention to the feet and get them the care they needed, there was a big discrepancy between thought and action. 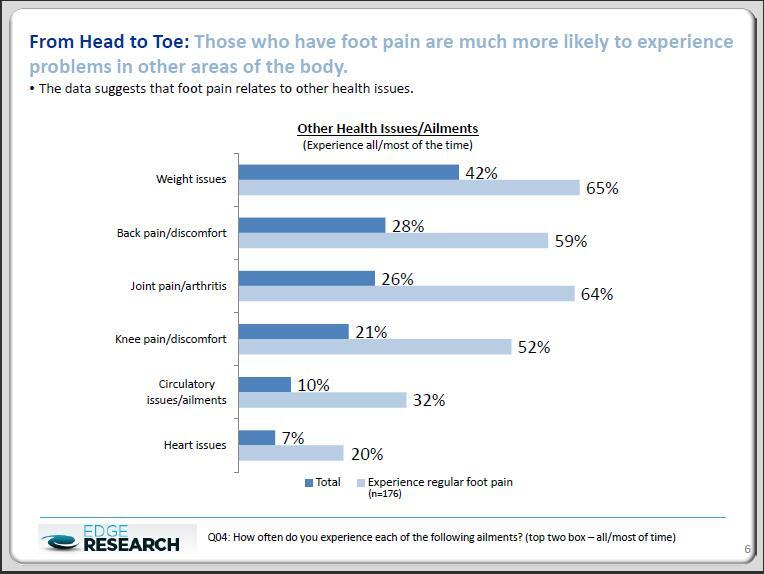 Only two in 10 people thought about foot care regularly, aside from toenail trimming. When small problems become large, about sixty percent of people will ask their primary physician what to do. Very few people will see a specialist for their foot issues, even though they acknowledge that a podiatrist has the most expertise. Most people research their conditions online and self-medicate with over-the-counter products. This approach can save a lot of time and money if you find the answers you need right away. How can people improve their foot care at home? The primary reason many people end up with repeat foot infections is that they treat the foot, but fail to treat their footwear — which have become petri dishes of bacterial, fungal, and viral pathogens. The bacterial buildup is what causes foot and shoe odor. Since shoes are hard to wash in the machine without wrecking them, we have found that ultraviolet light is not only more effective at eradicating harmful microbes — but also easier on the shoes themselves. In the past, podiatrists told foot fungus patients they had to throw out all their old footwear, since the tiny spores inside the contaminated shoes would re-infect them. Now you can keep your shoes and have cleaner, more sanitary feet too! Our product has earned the APMA Seal of Acceptance and is recommended by hundreds of podiatrists and laser toenail fungus clinics across America. Visit our main site to order a 30-day risk-free trial of the SteriShoe UV shoe sanitizer and see for yourself.